One of the people I follow on Twitter is @pacduneslooper. As his name suggests, he’s a caddy at Bandon Dunes. We’ve had a little back and forth on Twitter and he’s a funny dude who loves golf, the Oregon Ducks and the Portland Trail Blazers. Seems like he’d be a good dude to have carry your bag or tee it up with. I’m not going to lie to you, I was a bit jealous. 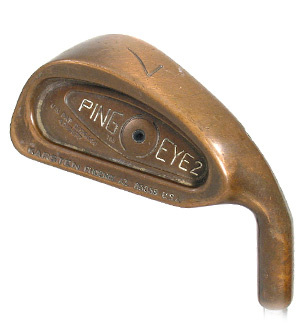 As a junior golfer in the late 80s, I think I would have given anything for some beryllium copper Ping Eye 2s. They were some sweet sticks that were usually reserved for snotty rich kids from the suburbs. I honestly can’t remember how much they cost. But it seemed at the time like they were so expensive. So was there a club or set of clubs that you always wanted? I have a thing for copper clubs, in particular wedges and putters. BeCu is so soft it’s incredible around the greens.